Blood donation centers are one of the primary healthcare providers who can make use of the skill of a newly qualified Phlebotomist, performing a vital function that saves millions of lives annually. 4.5 million patients need blood transfusions each year in the U.S, that’s around one transfusion every two seconds, and one pint of blood can save up to three lives. Despite the life-saving value of donated blood, less than 10 percent of people in the U.S donate annually. 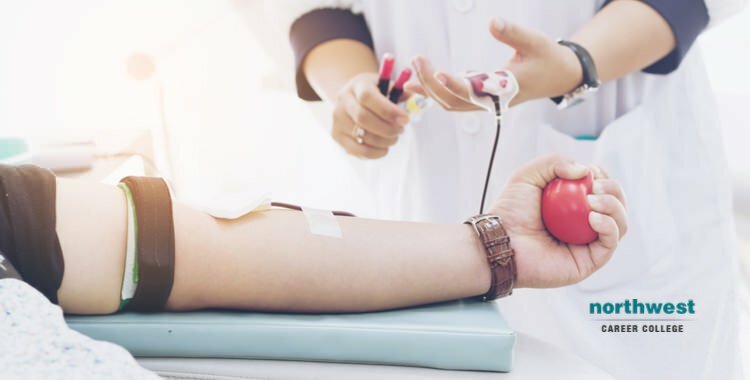 But the benefits of giving blood aren’t just available to those getting transfusions, the act of donating blood can also have tangible health benefits for the person giving it. It’s a mini-checkup – While it is definitely not a replacement for going to your doctor, you are given a physical check-up before blood donation that can uncover underlying health problems. In order to make sure you are healthy enough to give blood, your pulse, blood pressure, body temperature and hemoglobin levels are generally checked before donation. After donation, your blood is screened for anything that could make it ineligible for transfusion. Any potential health problems that are found in either of these two screenings will be reported to you, potentially highlighting issues you had yet to notice or reported to your physician. Hemochromatosis – A blood disease that causes an unhealthy buildup of iron, hemochromatosis affects one in every two hundred people in the U.S and often goes undiagnosed. This is because the primary symptoms, joint pain, fatigue, general weakness and weight loss, can often be confused with the symptoms of more prevalent conditions. Untreated, hemochromatosis can lead to eventual organ failure. The good news is that one of the treatments suggested by the Centers for Disease Control and Prevention (CDC) is the removal of red blood cells by phlebotomy or donating blood. As hemochromatosis is a genetic disorder, and cannot be passed on by the donor, blood from hemochromatosis sufferers can still be used in transfusions. Giving blood on a regular basis can be part of the treatment for hemochromatosis and can even help to diagnose the conditions in patients who were unaware that they had it. Reduced risk of heart attack – According to a recent study conducted by the American Journal of Epidemiology, donating blood at least once per year could reduce your risk of a heart attack by 88 percent. Giving blood reduces your risk of heart attack by removing iron buildup in your blood vessel, deconstructing them and allowing them to operate more efficiently. Improved mental state – Donating blood is purely a charitable act, as the donor often receives nothing, apart from the health benefits listed above and potentially a cookie, in return. An unrestricted act of giving can often improve your mood and help to fight the symptoms of depression. A 2017 study of blood donors found that they experienced an improved attitude and outlook for up to one week after giving blood. At Northwest Career College, we pride ourselves on providing the premier Phlebotomy Schools in Las Vegas. Our phlebotomy students have an 89% national exam pass rate, and you can graduate in as little as three months. Our established, seasoned instructors will take you through every aspect of Phlebotomy and Northwest offers day, afternoon and night classes to accommodate your busy Las Vegas work and family schedule. Call us today at (702) 403-1592 to speak to one of our admissions specialists about your new Phlebotomy career.